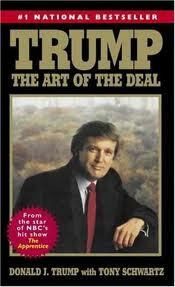 Donald Trump refers to deals as �his art form� and credits himself to be a deal-making wiz in business. Can Trump effectively use his dealing prowess to help the American economy? What impact will Trump have on the American politics? We�ll reference of one of his deals in New York to create ties to what he could do in Washington. The first chapter consists of Donald Trump walking the reader through a work week in his life, and summarizes what he did almost every hour of every day. Some of the summarizations are bogus, such as how Trump had a can of tomato juice at 3:00 P.M. on a Monday, while other interactions are much more important, such as Allen Greenberg�s monitoring of Holiday Inn stock, or Trump�s lawyers who were indulged in their current lawsuit with the National Football League. Despite what the task is, Trump goes into the specific details in order to give the audience the full Donald Trump business experience. This especially comes in handy when analyzing Trump�s deal of rebuilding Wollman Rink in Central Park. As Trump describes it, Wollman was built in 1950 and set for renovations in 1980 that would take about 2 years. Then in 1986, the story broke out that the city would be starting the process entirely over again, and that the rink would be open in another 2 years. Trump wasn�t pleased, and most importantly thought he renovate the rink better, and faster. After straggling with New York City Mayor Ed Koch, whom Trump referred to as a �bully�, Trump and the city came to a deal where Trump would put up $3 million and the city would reimburse him once the job was done, and if the rink was efficient. The one important facet to keep in mind with the construction of the rink, was that it was extremely low-risk on Trump�s side. New York City had taken such a long time in attempting to complete the renovation, largely because Mayor Koch was jostling with a political scandal, drugs were rampant around the city and the murder rate was sky high. The city simply didn�t have the time and funds to renovate Wollman efficiently. Here�s where Trump inserted himself. If he could manage to renovate the park quickly and ahead of schedule, his image would be immediately boosted in the public eye and the politically, the private sector would be seen as a viable option for getting things done quickly, without any red tape, or barriers getting in the way. By finishing under budget and ahead of schedule, Trump wanted to make the assertion that the private sector could function better than the public sector, or in this case that he could renovate Wollman Rink faster and better than corrupted, slow and incompetent bureaucrats in the NYC government. In a sense, Trump wanted to brand himself as an efficient, savvy and sympathetic businessman who works for the needs of the community. Politically, Donald Trump�s views towards Mayor Ed Koch and the NYC municipal government, draws a resemblance to the picks in his cabinet so far. In the 1980�s, when Art of the Deal was written, Trump depicted bureaucrats as ineffectual, and sought to best the work they did on the Wollman Rink. Today, Trump boasts that the antidote for a struggling middle class is capitalism, and by giving the reins to corporations in the private sector to run the country. This can be seen by picks such as Rex Tillerson, CEO of ExxonMobil, who has no political or military experience, and Scott Pruitt for head of the EPA, who is a climate change denier, and is against any clean power initiatives going forward for the United States. Even at face value, Trump is a businessman. His experiences stem from what he has achieved in the private sector, and not from what he has politically done in the public sphere. He has no experience in politics, and the only way he knows how to achieve anything, is through corporations taking control. Just like he did with Wollman Rink, Trump will attempt to privatize the United States: something that does not, and will not work for the average American. Donald Trump: Rent control only benefits a privileged minority. Donald Trump: Rebuilt Wollman Rink in 4 months; city failed for 6 years. Donald Trump: First Atlantic City casino ever finished on-time & on-budget. Donald Trump: You can't con people for long; you have to deliver the goods. Jimmy Carter: Asked Donald Trump for $5M for Jimmy Carter Library. Thomas Kean: Supported construction of Atlantic City casinos in recession. The above quotations are from Trump: The Art of the Deal, by Donald Trump.